Eire Texts are charged at €2 per message; multiple questions may require more than 1 text reply. Maximum texts sent per reply are 2. You must be over 18 to use this service and be the bill payer or have the bill payer’s permission. SP MTL Ireland: customer service 0766801002. All mobile numbers stored in our Data base are used solely by Wishing Moon services and will NOT be used to promote any other service or product. We will send you Free promotional text from time to time, reply at your discretion or simply discard or Text 'STOP' to 51444. Psychic telephone readings from phenomenally gifted clairvoyant seers, blessed with the gift, guided by spirit and dedicated to providing you with an insightful psychic reading. "The best psychic reading I have ever had"
At Angel Wishing Moon we choose only the very best intuitive, clairvoyants, psychics, love and relationship psychics, psychic mediums and psychic tarot readers for our telephone readings. See if your favourite readers are available for a live telephone reading. Insightful psychics are waiting to answer questions on your future, love, life and relationships. Text ANGEL and your question to 78887. SMS cost £1.50 per msg, max 2 per reply. 18+, SP:InverOak.com PO Box 10015 CM1 9HH. To stop text stop, or to opt out of free promo msgs call Helpline 0207 111 6210. We have gathered an exceptional team of psychic readers and a wide range of psychic services to meet everybody’s spiritual needs. All of our psychic readers are based in the U.K. and each has been handpicked based on their intuitive gift, honesty and experience. Get a live psychic reading today by calling 0906 403 1120 – you’ll be greeted by a pleasant voice who will guide you to the correct reader for you. 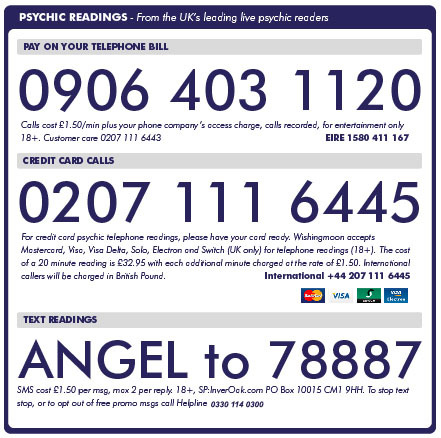 Our psychic readers are available 24 hours a day via our psychic hotline and you can view which readers are available right now by checking the Live Reader Status. Our professional and gifted tarot readers provide unique and comprehensive tarot readings and live psychic readings. The art of tarot reading is an ancient and mysterious form of mediumship still very much in demand in the modern day, with many people benefiting from having a reading. The tarot readings might be concerning love and relationship advice, family life, career and financial issues and as a means to identify life events that might be on the horizon. Having a tarot phone reading can help guide and give clear answers and insight to many of your life questions. Our talented and friendly clairvoyants can tune in to the energies surrounding a person with their extra sensory and heightened perception, often referred to as their “sixth sense”. With this rare and unique gift they are then able to see images in connection to you and your life. The images will form certain messages which are then clearly relayed back to you in a psychic live reading. All telephone readings are personal and unique and you will receive great insight into your past, present or future. The clairvoyant may touch on areas of your love life, relationships, career or home life.